#1 International bestselling novel set in 1920s Ceylon, about a young Englishwoman who marries a charming tea plantation owner and widower, only to discover he's keeping terrible secrets about his past, including what happened to his first wife, that lead to devastating consequences. Whenever I see the label "International Bestseller" on the cover of a book, I always know I can buy it and never have any regrests! This fact alone, along with the stunning cover of this novel, made it a must read for me. And I was not disappointed. I adore family dramas, and this is one that is set in Ceylon in the early 1900's. Beautiful descriptions of scenery, customs, and characters, made the story spring into authentic life. 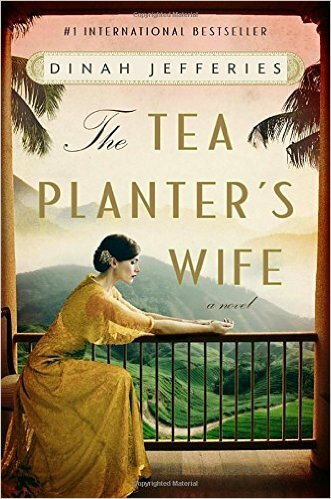 First there is Gwen who travels from England to Ceylon to join her new husband on his plantation. Secondly, there is Verity, her needy sister-in-law who causes problems for Gwen and comes between her and her husband. Thirdly, there is her husband Laurence, whose love for her slowly cools for no obvious reason. And lastly, there is the raw political climate of Ceylon with all its cultural expectations and problems. To say Gwen experiences culture shock, is a gross understatement. With plenty of underlying conflicts, some blatant, some subversive, this book became a real page turner for me. There was always something going on, something that engaged me, and something that drew upon my emotions. And slowly secrets are revealed as people put their own machinations into play. Yup, this was entertaining at all levels. Definitely a fun, engaging book. It's no wonder it is an International Best Seller. Well worth it for entertainment value!